Rain Barrels are a great tool for promoting water conservation and reducing stormwater runoff in a community. 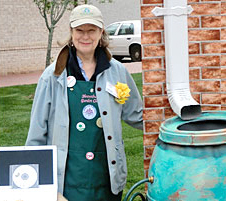 The goal of the Rain Barrel Train the Trainer program is to provide environmental commission members, recycling coordinators, educators, Extension Master Gardeners, garden clubs, and environmental organizations with the tools to teach their communities about the environmental benefits of rain barrels. the tools to conduct rain barrel activities in their communities. Program participants are provided with the Rainwater Harvesting with Rain Barrels- Trainer Manual which includes all the program materials on CD so they can easily put the information to work. Template materials are provided in the manual’s appendices which can be adapted for individual organizational needs when planning and conducting a rain barrel activity. A template scripted presentation in PowerPoint format is also included that can be used during speaking events. 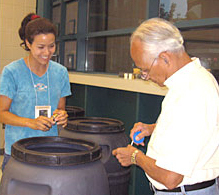 Additionally, participants have the opportunity to build their own rain barrel for use in their community. The manual is also available for download. Fill out this form and then download a copy of the manual. 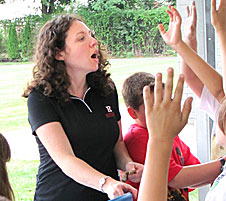 For more information about the Rain Barrel Train the Trainer program or dates for upcoming workshops contact Michele Bakacs, Environmental and Resource Management Agent- Middlesex and Union Counties.